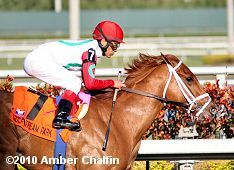 The $750,000 Florida Derby (G1) at Gulfstream Park is one of the key preps for the Kentucky Derby, with recent winners Barbaro and Big Brown going on to take the roses. 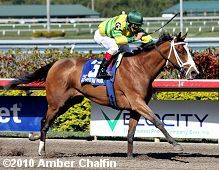 A field of 11 three-year-olds went 1 1/8 miles, one full lap of the main track on Saturday afternoon, with Rule sent off as the 9-5 favorite off wins in the Jean Laffitte and Delta Jackpot in Louisiana, and then the Sam F. Davis at Gulfstream, the major local prep for this race. 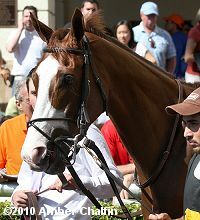 In to challenge him included 3-1 second choice Radiohead, an allowance winner last out but winless in stakes company since last June, and 6-1 third choice Miner's Reserve, a maiden winner last out and making his stakes debut in his third lifetime start. 18-1 Pulsion on the rail and Rule to his outside battled for the lead for the 7 furlongs, through fractions of 23.21, 46.46, and 1:10.76 over the fast main track, with Radiohead stalking them another 1 1/2 lengths back in third. In mid-stretch, Pulsion tired badly allowing Rule to open a 2 length advantage at the 1/8 pole through 1 mile in 1:36.09. Late-running 29-1 Pleasant Prince passed the favorite on the outside to get a short lead at the 1/16 pole, but 20-1 Ice Box closed with a rush down the center of the course to nail Pleasant Prince by a nose in 1:49.19. It was another 1 1/4 lengths back to favorite Rule third, and a long 4 1/2 lengths back to 10-1 Lentenor fourth. Left: Ice Box after winning the Florida Derby. 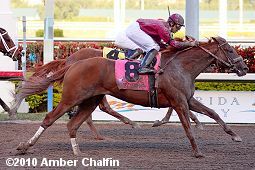 His trainer Nick Zito said, "I have to take it one step at a time with this horse and be thankful that he won this race. That's the way we're going to approach it. You can think about running him back in 3 weeks and then another 3 weeks (Derby), but we'll just have to figure that out. There is a possibility that we run a race before (Derby), but this race obviously was a tough race. He's had 3 tough races in a row, so I've got to see what I'm going to do with him. We expected him to be well off the pace early in the race and then make his run. The post for him doesn't really matter that much because he's just going to drop back and get over to the fence. 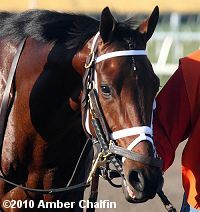 We'll take him to Churchill, sometime after April 1 depending on how he is doing." Right: Ice Box in the post parade before the race. His jockey Jose Lezcano said, "I just let him go at his own pace through the first part of the race and didn't want to rush him. At the 5/8, I started to ask him a little bit and he got to running along. Then I got into him a little more at the 3/8, and that's when he took off and started flying. I was a little worried that I would have to go too wide on the turn and use him too much then, but I knew I needed to get him in the clear so he could keep up his run. I didn't think the other horse (Pleasant Prince) would stay there like he did, but I knew in the last jump that my horse got there and stayed there." Left: Second place finisher Pleasant Prince before the race. 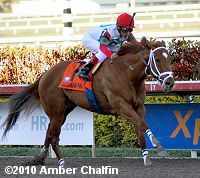 His trainer Wesley Ward said, "I've always thought a lot of this horse. With a little more luck and a different trip last time (4th in Fountain of Youth) he might have been second. He's trained brilliantly since then and had a sensational work. Horses at this time of year can take such leaps, improve day-to-day, and I think this horse is has been doing that. We just have to hope he keeps moving in that direction. We'll take him to Keeneland." Jockey Julien Leparoux added, "We had a good trip and he fought really hard down to the wire. He ran well last time too and he's getting better." Right: Third place finisher and beaten favorite Rule before the race. 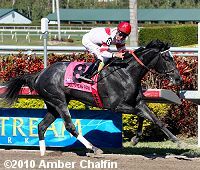 His trainer Todd Pletcher said, "Johnny just said that he ended up going quicker into the first turn than he really wanted to, that if he could do it over again, he would have gotten him to settle a little more and sooner.� But he ran well.� It wasn't that he wouldn't rate; he just didn't make the decision to settle and if he could do it over, he would have ridden it a little differently.� This doesn't really change anything.� We'll work him a few more times here and head to Kentucky." Jockey John Velazquez added, "He was going along pretty good and he was settled, but I probably should have eased him back a little. I had him in the perfect position going through the first turn and I was able to keep some of the other horses out, but once (Pulsion) got in there I went to grab him, and he sort of forced my hand a little because by then my horse wanted to go. I probably should have taken my horse out of there from the beginning. He is such a fighter. It was hard with all those sprinters in there, I knew we were going too fast but it was hard settling down with all of them. But he's a top quality horse and he will have no problems moving forward." Fourth place finisher Lentenor in the post parade. His jockey Alan Garcia said, "He ran a good race. I'm satisfied with his effort. He was moving well, and I tried to follow (Pleasant Prince), but my horse ducked and lugged in, and we lost some momentum." 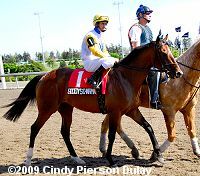 The full brother to 2006 Florida Derby and Kentucky Derby winner Barbaro raced in 10th early about 6 lengths off the pace, then came out 4 wide for the drive and closed well to finish fourth beaten 5 3/4 lengths. He, along with full brothers Barbaro and Nicanor, are named after foxhounds in the painting "Foxhounds Meute de le Mr. Le Comte de Barral" by Louis Godefrou Jadin. The $150,000 Swale Stakes (G2) featured a field of 9 three-year-olds sprinting 7 furlongs on the main track. Hutcheson Stakes winner D'Funnybone was sent off as the 1-2 favorite over 4-1 second choice Ibboyee, third in the Hutcheson last out, and 10-1 third choice Dixie Band, unraced since finishing 10th in the Breeders' Futurity at Keeneland in October. 16-1 shot Hear Ye Hear Ye shot to the lead exiting the chute through an initial quarter in 22.24, but was soon passed by D'Funnybone through a half in 44.50. Entering the stretch, D'Funnybone opened up on the field, getting 6 furlongs in 1:08.95 while 2 1/2 lengths in front. Ibboyee, last early, came out 4 wide for the drive and closed well but was left with too much ground to make up, as D'Funnybone cruised under the line1 1/4 lengths clear in 1:21.98. It was another 2 1/4 lengths back to 35-1 Privilaged third. D'Funnybone runs out after the race. 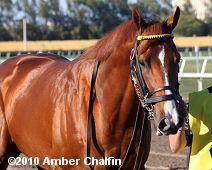 His trainer Richard Dutrow Jr. said, "He ran like I thought he would. It looked like he was pretty much in control all the way. My first choice for him next would be the Withers, a one-turn mile, then see where we are." His jockey Edgar Prado said, "It was easy. He had a little pressure early but he was just galloping along. The track has been fast all day, so we just wanted to take advantage of that. There was really never any concern out there; maybe a little when a couple of the horses hooked up with him early, but he was always going along at a cruising speed, and at that point I hadn't asked him to go yet. To me, the way he is running now is great, and we'll leave it up to (trainer) Rick (Dutrow) whether we try and take on more distance." The $200,000 Bonnie Miss Stakes (G2) is the major local prep for the Kentucky Oaks, featuring a field of 6 three-year-old fillies going the Oaks distance of 1 1/8 miles on the main track. 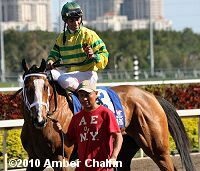 Christine Daae, winner of two straight allowance races and making her stakes debut, was sent off as the 6-5 favorite over 3-2 Amen Hallelujah, winner of the Santa Ynez at Santa Anita and the Davona Dale at Gulfstream. 9-2 Switch, third in the Las Virgenes last out, completed the top three on the board. Switch was sent to the lead by jockey Tyler Baze and set early fractions of 23.68 and 47.28 around the clubhouse turn while being stalked by Amen Hallelujah to her outside and Christine Daae out in the 4 path. On the far turn, Amen Hallelujah took over the lead through 3/4 in 1:10.76 as Switch tired from the early pace. 7-1 Devil May Care, who was 4th early, came out wide into the stretch to pass Amen Hallelujah at the 3/16 pole and drew off to win by 2 3/4 lengths in 1:49.06 over the fast track. It was a long 5 lengths back to 12-1 Joanie's Catch third. Favorite Christine Daae stayed within 2 lengths of the pace into the stretch then tired badly to finish 5th beaten 13 3/4 lengths. 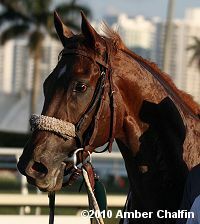 Devil May Care returns after the race. Her trainer Todd Pletcher said, "We've always thought a lot of this filly, but I'm not surprised that some could be a little skeptical after her last 2 races. In the case of the Breeders' Cup it was simply a matter of she hated the synthetic. She trained great for the race in Louisiana, but then she misbehaved at the gate and then they got pretty severe with her and then used tongs, which most fillies don't handle well. When she made the lead so easily today she ducked when she started to see things, which makes you consider putting blinkers on, although you don't like to that after a winning race. We'll see about that. She'll go right to the (Kentucky) Oaks from this race." 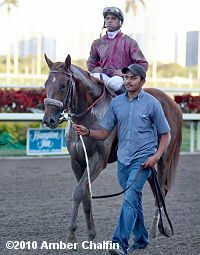 Her jockey John Velazquez said, "I saw that (Amen Hallelujah) was still in hand, but my filly too was in hand too, and I always knew we were able to go by any time I wanted. But the most important thing with this filly is to not make the lead too soon, because I know that once she makes the lead, she tries to stop and wants to put the brakes on. She did that today; and then she started going in and out a little through the stretch. But when I got her mind back to running, she kept on going with a nice kick. She has tremendous talent, but she still has some learning to do." Left: Second place finisher Amen Hallelujah runs out after the race. Her jockey Julien Leparoux said, "She got a little tired last and she started to pull a bit, but I think it was a good race and she'll be in good shape for the (Kentucky Oaks)." Right: Sixth place finisher and beaten favorite Christine Daae in the paddock before the race. Her jockey Corey Nakatani said, "She never really settled like we thought she was going to. But it wasn't a disgrace; there are some nice horses that were in there. Patrick (Biancone) told me the timing of the race might be a little bit quick back for her. I didn't want to ask too much of her on the turn. We'll just go back to the drawing board with her and go get the next one." The $150,000 Rampart Stakes (G3) featured older fillies and mares going 1 1/8 miles on the main track. Unrivaled Belle, 4th in the La Canada at Santa Anita last out, was sent off as the 9-5 favorite in the field of 8 over 2-1 second choice Bambera, making her U.S. debut after winning 6 straight stakes races in Venezuela and Puerto Rico, and 4-1 third choice Aurora Lights, winner of the Sabin last time out. Unrivaled Belle opened up a 1 1/2 length lead on 26-1 Champagne Eyes first time past the stands and set fractions of 23.72, 47.43, and 1:11.26 over the fast track. Entering the stretch, Champagne Eyes moved to within a length of the favorite but Unrivaled Belle easily turned her away, opening up through the stretch to win by 1 3/4 lengths in 1:49.36. It was just a head back from Champagne Eyes to late-running 7-1 Miss Singhsix third. Her jockey Kent Desormeaux said, "She froze going into the gate, but that's all it was. It's not a simple thing to explain, but hopefully it's something she gets over. The last couple of times we tried to hold her off the lead and I was a little disappointed with the way she ran, so I thought maybe we should employ a different tactic today and go for the lead. Thankfully that change in the plan was successful. At no point late was I worried that the other horses were going to come get her, she still had plenty left at the finish." 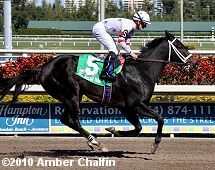 The stakes action moved to the infield for the $100,000 Appleton Stakes (G3) as a field of 8 older horses sprinted 7 1/2 furlongs on the turf. Rahy's Attorney, a disappointing 9th in the Canadian Turf Stakes last out and winless since the Bunty Lawless at Woodbine in October, was sent off as the 9-5 choice over 7-2 Kiss the Kid, seventh in the Donn Handicap last out after finishing a close second in the Fort Lauderdale, and 6-1 third choice Society's Chairman, unraced since finishing third in the Sir Barton Stakes at Woodbine in December. 8-1 Storm Play went to the lead early and set fractions of 24.75 and 47.10 over the firm course with Rahy's Attorney stalking him a length behind. Entering the stretch, Storm Play stubbornly held the lead to the 1/8 pole through 6 furlongs in 1:10.45 before tiring at the 1/16 pole. Society's Chairman, who was last for the first 5 furlongs, closed with a rush down the center of the course to nail Rahy's Attorney by a head at the line in 1:27.79. It was another 1 1/2 lengths back to Kiss the Kid third. 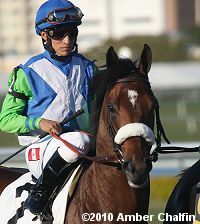 His trainer Roger Attfield said, "He's had his share of problems over the years, which explains why he hasn't run that many times (20), but I space his races and give him time when he needs it, and he runs his race for us just about every time. A mile is probably his best distance and he likes a shorter stretch rather than the longer one at Woodbine. I'll take him to Kentucky and perhaps run him once there or just wait until we get back home (Woodbine) and run in the Connaught Cup early in the meet (May) again." 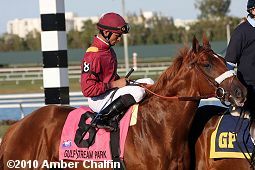 His jockey Jose Lezcano said, "This was my first time on the horse, so I watched a couple of his previous races. It looked like he may have been asked to move a bit too soon, so the trainer told me to take him back and just wait. I knew at the 1/4 pole that I had plenty of horse, and when the other horses started to move, it was time to ask my horse for his run. And when I asked him, he gave a big kick from the 1/4 to the wire."